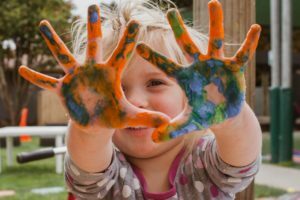 How can I get a tax break for child care? More than 60% of children under age six in the United States have two parents in the workforce. 1Many of these working parents must spend a burdensome share of their earnings on child care, especially if they don’t have relatives who are willing and able to help out. The following tax benefits may help you offset some of the costs paid for a nanny, babysitter, day care, preschool, or day camp, but only if the services are used so you can work. Families with one qualifying child (typically age 12 or younger) can claim up to $3,000 per year in child-care expenses; those with two or more qualifying children have a $6,000 annual limit. The credit is worth 20% to 35% of eligible child-care expenses, depending on income. As income rises, the credit amount drops until it hits a minimum of 20% for households with $43,000 or more in adjusted gross income. For example, families with one qualifying child can receive a credit of $600 to $1,050; those with two or more children can receive a credit of $1,200 to $2,100. A tax credit lowers a family’s tax liability dollar for dollar. Higher-income families may realize a bigger tax benefit from an FSA if it is offered by an employer. Up to $5,000 a year can be set aside to cover eligible child-care costs for qualifying children, and this money is free of federal income tax and Social Security and Medicare taxes. You are not allowed to use pre-tax money from an FSA and take a credit for the same expenses. However, after spending $5,000 from an FSA, you may take a tax credit for up to $1,000 in additional child-care expenses if you have more than one child. Pensionmark Financial Group does not provide tax or legal advice. Please consult with a tax professional prior to deciding on any distribution option.